Okay, reality bites only some of the time. But real life can be so hard at times. Life is hard when you are surrounded by kids, laundry, making dinner, chores and dogs. Not to mention money troubles. That is why I like to read. When life gets hard, I read. Because it is so much easier to be in the pages of a book. The problems get solved and relationships get mended in 400 pages or less. I enjoy reading a book that has the to power to take me away from my reality to enjoy, to feel sad, to laugh with, to cry with the characters in the book. I thoroughly enjoy the authors that have the ability to let me escape reality, even for a little while. This week I have spent time in some wonderful worlds. Diana Palmer’s Diamond Spur took me to Montana and to life on a ranch. I love the old-fashioned feel of her books. Her characters are rugged and handsome. And the story line is endearing and unforgettable. I enjoyed the vivid descriptions and details of life on a ranch. I enjoyed being on a ranch for a while. 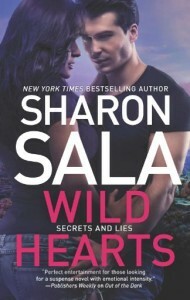 Sharon Sala new book called, Wild Hearts (book 1 in the Secrets and Lies Trilogy) takes me to Mystic. This story has the heroin coming home to the sudden death of her father. While all things point to him committing suicide, she doesn’t believe it. Her father would not do that. The chief of police happens to be the man that she left behind to follow her dreams. Now he is the only one to help her. The story is poignant and touching. The pull between the main characters is what I like to read. Where they are always being pulled together to face what they need to deal to make it work and in this story make it work again. She always writes in threes. So I’m excited for the next one to come out in August 2015. Another author that has the ability to pull you in is Kerrelyn Sparks. I have just finished book 8 and book 9 in the Love at Stake Series. Book 8 is called The Vampire and the Virgin. Corny title but very sweet story. This is Robby’s story. He was tortured by the Malcontents and is being forced to take some R&R. He doesn’t think he needs any emotional healing until he meets Olivia. Book 9, Eat Prey Love, has Caitlyn falling for Carlos from the first moment she sees him. After she is welcomed into the world of vampires and shape-shifters, her and Carlos head into the wilderness to find some of their own. The background story line in the Love at Stake Series has been entertaining and fun to get to know. It’s full of complicated characters and dynamic fight scenes. I have enjoyed being in their world as it gets more and more complicated with each book. So thanks to Diana, Sharon, and Kerrelyn for giving me a break. Previous Post I love it when a book makes me cry!